The Valley of Butterflies is an earthly paradise that lies 25 km southwest away from the city of Rhodes. From mid-June to mid-September, countless of butterflies ‘’occupy’’ the valley creating an amazing natural phenomenon. The butterflies belong to the rare species of Panaxia Quadripunctaria, also known as tiger moth. They gather in the valley because of its microclimate, to feed and multiply. The physical beauty of the valley with running waters, wooden bridges, small waterfalls and lakes make even the most discerning visitor to stay speechless in front of this unique sight. The valley extends in an area of about 60 hectares, along the sides of the river Pelekanos. The stone stairs encountered by visitors of Petaloudes leading to the monastery of Panagias Kalopetras built in 1782. In the valley, there is the Natural History Museum of Rhodes. 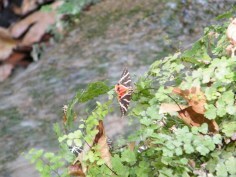 Operating hours of Butterflies valley: 08:00 – 18:00 and the inlet costs €5,00.